I'd read the book some years back and would have thought any attempt to translate it to screen would be embarrassingly weak. I was so wrong. 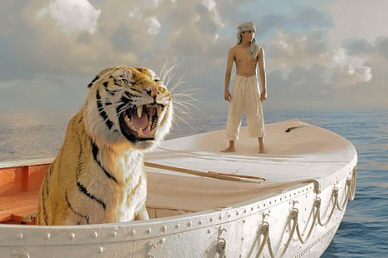 Life of Pi, the film, is adapted well and visually realized beyond all expectations. See the 3D version if at all possible. Ang lee delivers a picture that teases your intellect, squeezes your heart, and quenches your thirst for good art. If you're up for a powerfully dramatic, picturesque film preceded by some interesting philosophy, and followed by a reflective human-experience riddle -- have a look. Life of Pi. Copyright © 2012. Directed by Ang Lee. Written by David Magee, Yann Martel. 20th Century Fox.